We provide here information up until the end of the mid year recess, and it is up to date as at the first week of August 2014. You can find information on specific terms by clicking on the Statistics drop down menu under the banner on the right. The first chart sets out the total number of applications the Constitutional Court has received so far in 2014, and gives a snap shot of how those applications have been treated. The Constitutional Court has received 132 applications, 64 of of which have been dismissed (most commonly leave to appeal has been refused). The Court has not yet taken a decision on 58 of the cases, and has enrolled 10 for hearing. Note that these numbers only apply to applications received in 2014. That is why although only 10 2014 applications have been enrolled for hearing, the Court has heard 18 matters so far in 2014. The majority of the matters heard in the first half of the year are made up of cases brought to the Court during 2013. 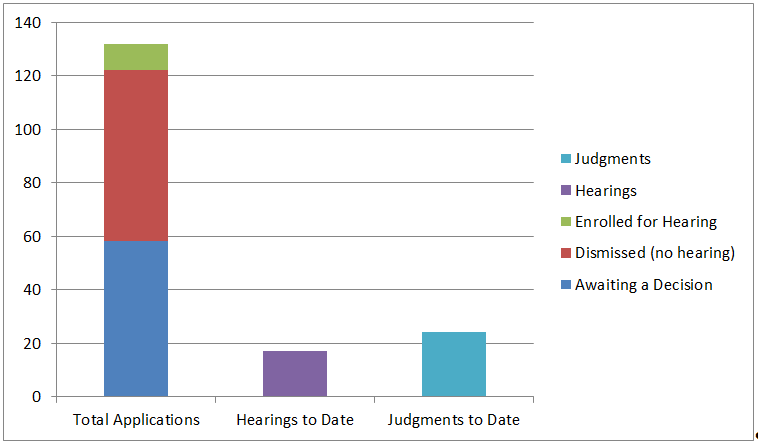 Similarly, most of the 24 judgments handed down so far this year relate to applications brought, and possibly even heard during 2013. This next chart shows more detail on the matters that have been heard and decided during 2014. 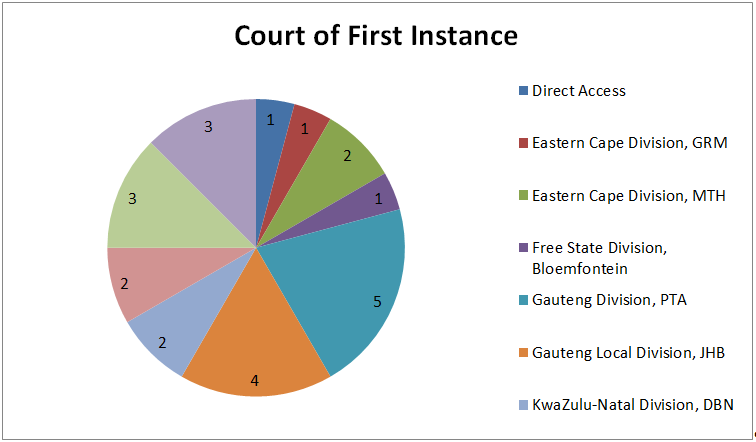 This graph shows the court that first heard a case that ended up in the Constitutional Court. 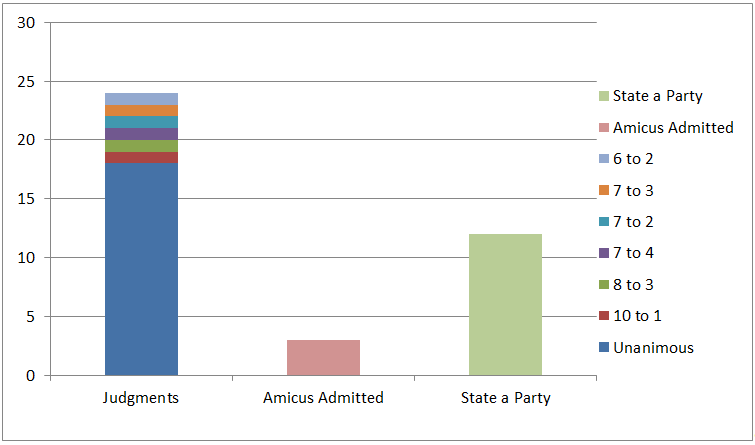 This graph shows how a case got to the Constitutional Court, i.e. did it go straight from the High Court to the Constitutional Court, or was there first an appeal to the Supreme Court of Appeal. 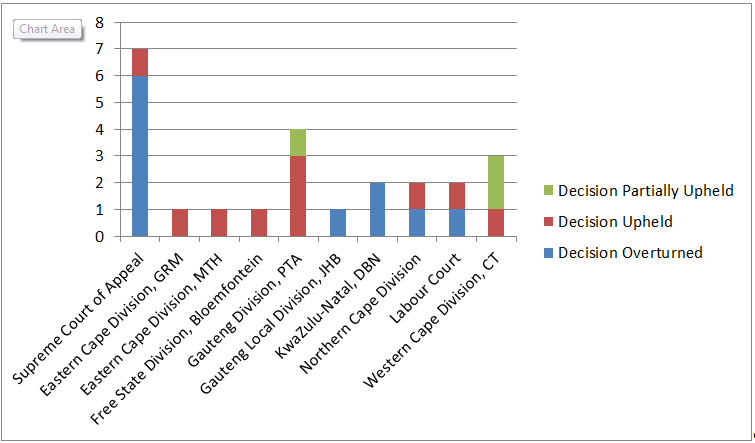 This graph shows the results of appeals to the Constitutional Court in relation to the Court from which the appeal was held. 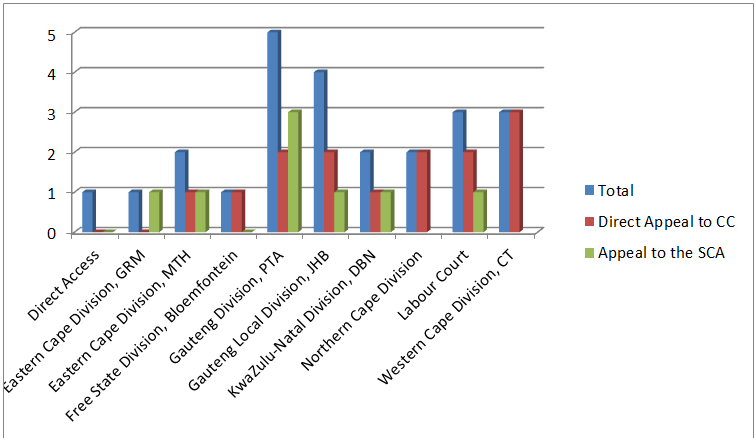 For example, if a case was first heard in the Eastern Cape High Court, and then went on appeal to the Supreme Court of Appeal, the Eastern Cape High Court’s decision is not reflected on this graph, only the Supreme Court of Appeal’s decision is reflected. The table below shows how many cases the justices have participated in, as well as how many times they have written: the main majority judgment; a concurring judgment with the majority, or a minority judgment. It also shows the number of times a judge votes with the majority or minority (this includes those cases where the judge has written the judgment). The table also shows the percentage of the time that the the particular judge is either in the majority or minority of the decision.